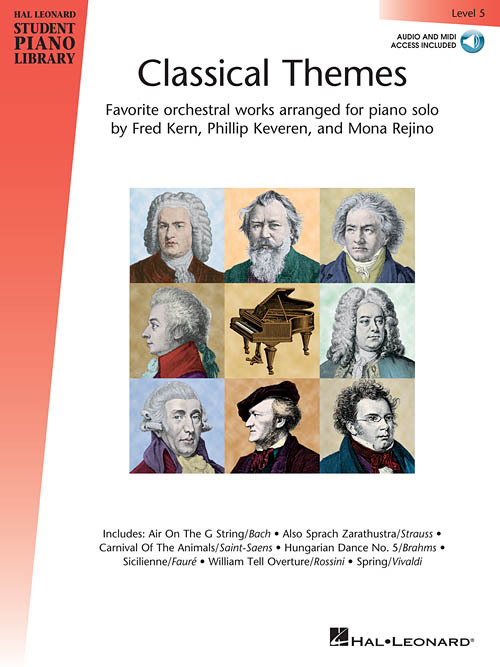 This series presents favorite orchestral classics, carefully graded and expertly arranged for piano solo with great teacher accompaniments! The accompaniments are available online for download or streaming. Level 5 includes: Air on the G String (J.S. Bach) • Also Sprach Zarathustra (R. Strauss) • Finale from Carnival of the Animals (Saint-Saëns) • Hungarian Dance No. 5 (Brahms) • Jesu, Joy of Man's Desiring (J.S. Bach) • Theme from Romeo and Juliet (Tchaikovsky) • Sicilienne (Fauré) • Spring (Vivaldi) • Symphony No. 40 (W.A. Mozart) • William Tell Overture (Rossini).